Before investing time and money in going to the field to collect data, you need to plan for it properly. Good planning for data collection can help you capture better, richer, more accurate data while saving your time and resources. Keep reading for 6 tips to help you plan for your data collection better. 1. Think critically about what data you need to collect. What information do you actually need? 2. Consider the cost of every additional data point. Once you have an idea of what data you want to collect, be sure to consider the cost of collecting that data. Every additional data point or survey question adds additional cost for your surveyors and respondents. 3. Don’t forget about identifiers. Identifiers — or information that identifies the source and context of a survey response — are just as important as the data on the subject or program you’re actually studying. Generally, more identifiers will help you pinpoint the successes and failures of your program more precisely, but don’t go overboard! 4. Be sure to consider how you will get each data point. Lots of data isn’t readily available. Sometimes the data exists, but you might not have permission to access it. For example, people’s medical information isn’t freely accessible unless you have a very good reason. Other kinds of information may be difficult to measure. While choosing what data you will collect, be sure to consider how difficult and quick it will be to collect each piece of information. 5. Mobile-based data collection is the way to go. While paper-based data collection is a classic, mobile-based technologies are the way to go in today’s world. They’re fast and accurate, and they allow you to collect lots of different forms of data at very low costs. With today’s explosion of cheap Android smartphones, there are few reasons to not choose mobile-based data collection. 6. Consider your options for mobile-based data collection. There are 3 main types of mobile-based data collection. First is IVRS (interactive voice response technology), which will send your respondent a phone call, where he/she will be asked pre-recorded questions. Second, SMS data collection will send your respondent a text message, then he/she can answer text questions on his/her phone. Third, with smartphone apps, field surveyors can enter data directly into an interactive questionnaire as they speak to each respondent. Each tool has its strengths and weaknesses, so be sure to choose the right one for your survey and respondents. 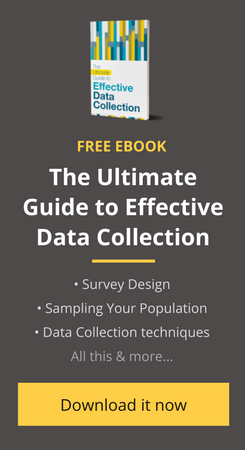 We’re covering this topic in far more detail in our first Udemy course — Planning for Data Collection. The course is live, so check it out! # 2. Looking at Respondents Fatigue sometimes it is very challenging to receive the response for the desired set of questions asked! Abdul, that’s a good question. The answer to that would be pretty long, so I’m going to add the question to our list of future blog posts. Clearly it’s worth further discussion. Thanks! Useful tips. I also typically ask three questions of clients – What do you want to know? What do you already know (or have data)? What do you have to know? These help to narrow the scope and often unearth existing data that is not being used so additional data collection can focus on gaps or new knowledge. I also work with many populations, however, for whom data collection via a mobile app would be completely impossible, and if I do so, bias the findings as to make them applicable only to a “mobile” subset of the population – what i fear is becoming very common among social decision makers. Thanks again for providing good ideas about which we can think more deeply. This is an excellent strategy using the mobile data collection. Thank you so much for this information is quite useful. Thanks for the very helpful blog. It will assist tremendously to compile data with the hints given in mind.